Start with a sentence. Or start with a little creature, dragging his claws across the page. But don’t let him go too far. These monsters can only eat 750 words. In “Little Creatures” we will oscillate between honing our sentences in the mirco-fiction form and sharpening our teeth on magical realism/fabulist themes. We will write modern fairy tales, fables, and stories that take place in a world that looks like ours, but refracted open and teeming with the surreal. Not a class for the faint of heart, “Little Creatures” is for those writers who feel like outsiders, who wander in the unknown and aren’t afraid of little blood. For writers who see the world sideways and injected with a little magic. Are you up for the challenge? *If you like Kelly Link, Aimee Bender, Brian Evenson, Benjamin Percy, Guillermo Del Toro, Michel Gondry, Frida Kahlo, or Angela Carter, or you’d like to add to your fantastical pantheon, this class is for you! 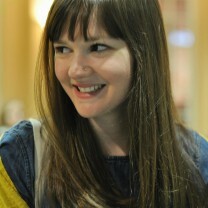 Meredith Luby is a graduate of Brown University’s Literary Arts Program in Fiction (MFA ’14). Meredith’s work has been featured in Redivider, Glimmer Train, The Collagist, alice blue, fields, Fourteen Hills, Banango Street, and elsewhere. She was a finalist for the Fairy Tale Review Fiction Prize and won second place for the Writers at Work Fellowship. This course will “meet” throughout the month of June. You will have continuous access to a shared, secure course space throughout the span of the workshop, and will receive a set of exercises, examples, readings and prompts at the start of each week. You’ll examine the micro-fiction form and master the key elements underlying all storytelling. At the end of each week you’ll have the opportunity to turn in work for formal feedback from your instructor, who will give you editorial comments, as well as suggestions for expansion in your reading and craft. You’ll also be able to ask questions in the course space, including the “office hours” forum. 4 rounds of feedback and instructive support with your workshop leader at the end of each course week; and encouragement of peer feedback and generating as much work as you desire!